The Mazda CX-5 has always been an admired compact crossover for those with seek something outside of the mundane appliance for everyday transportation. 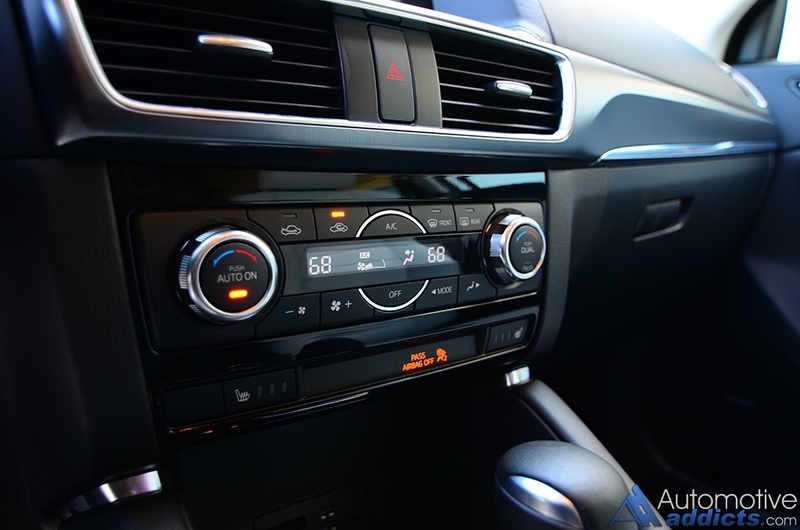 After a mild mid-year refresh in styling, revision of the suspension, the addition of more soft-touch interior materials, tweaking of the infotainment system, the addition of a few features, and added sound insulation, the Mazda CX-5 carries on its enthusiast-inspired compact crossover duties. 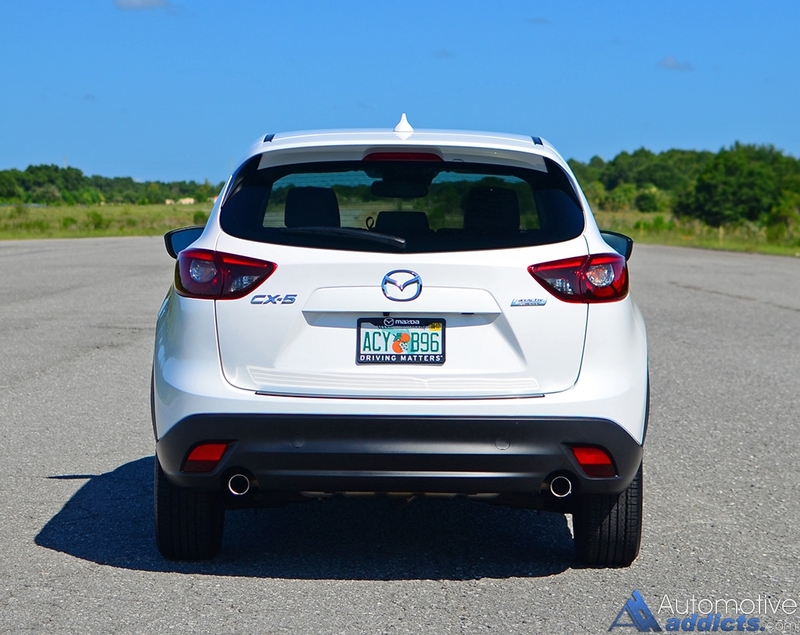 The 2016 Mazda CX-5 in its top-level Grand Touring trim gets automatic respect from me as an automotive enthusiast. The CX-5 embodies a sporty driving characteristic that emits a sense of stability while on the road without giving away to its crossover stature. Mazda cleverly makes the best use of its latest Skyactiv engine, a 2.5-liter 4-cylinder engine with 184 horsepower at 5,700 rpm and 185 lb-ft of torque at 3,250 rpm. The engine gets mated to 6-speed automatic transmission, the only unit made available for the 2.5-liter engine while you may opt for a 6-speed manual in the base 2.0-liter engine found in the base Sport trim but make due with only 155 horsepower and 150 lb-ft of torque. 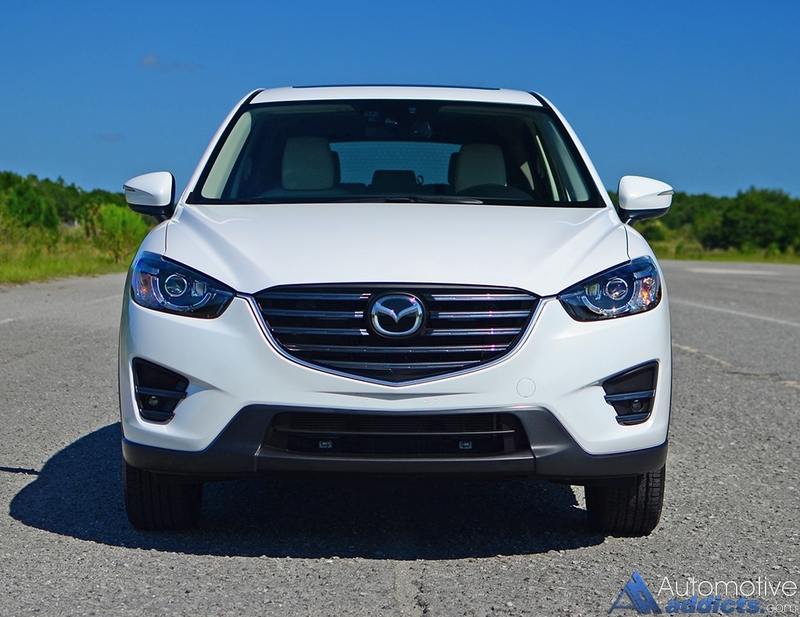 With its modest power output figures, the 2016 Mazda CX-5 keeps on pace in a consistent aspect. In a straight line, the CX-5 Grand Touring in the front-wheel-drive configuration makes it to 60 mph in about 7.7 seconds. Even though its acceleration isn’t conducive to being anything you want to contend with a sports car, the CX-5 holds its own well as it makes up for the power deficiency with remarkable handling and sharp steering. With that, the CX-5 plays on a lively driving characteristic that isn’t found in any of its competition. The steering effort is perfectly weighted, while the turn-in is crisp and goes exactly where you place it without fault. 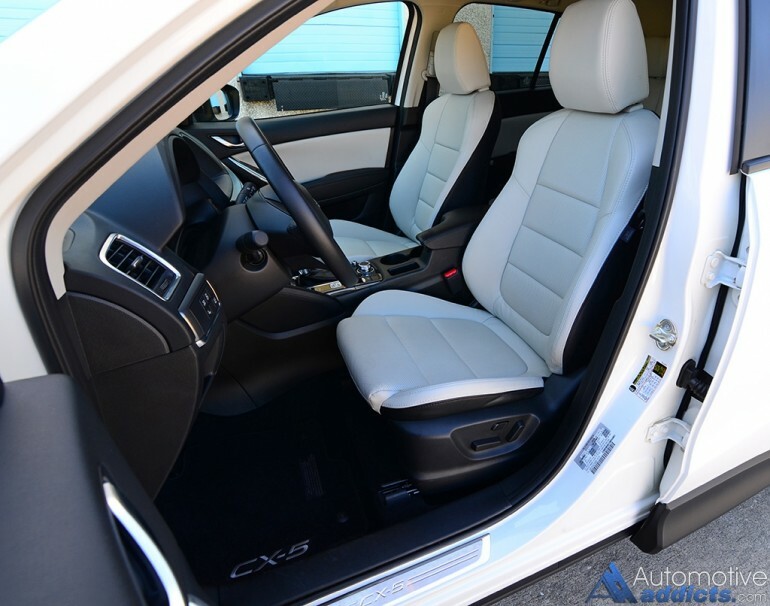 Ride quality is firm but not overly harsh, and the added sound insulation of the mid-year-cycle refresh keeps the cabin civil and more luxury-like when you need it to be. Mazda pays attention to its core buyers, and it shows in the enthusiastic appeal of vehicles like the new CX-5 in the many facets. The CX-5 is sharp-looking, has a decent interior that was recently updated to place soft-touch surfaces in the right places, and has the enthused driving appeal that buyers want in a compact crossover. 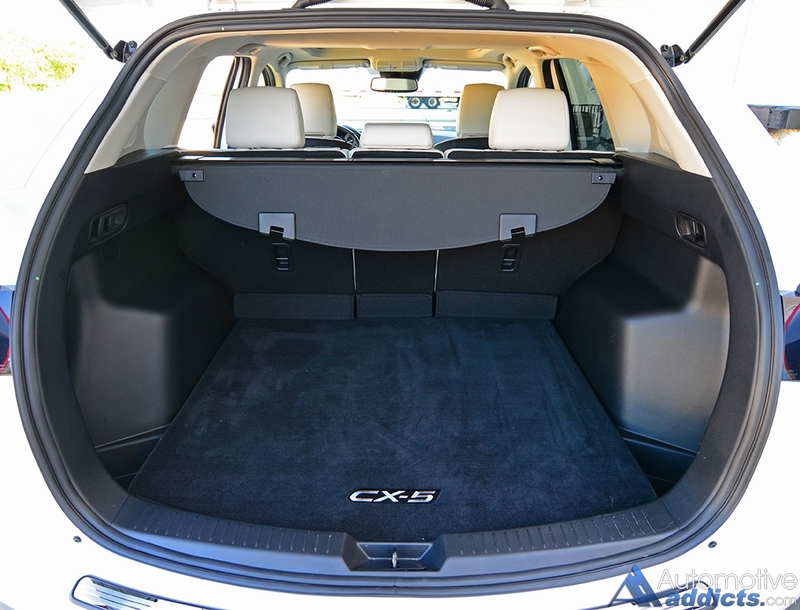 In the area of efficiency, the CX-5 doesn’t disappoint either. 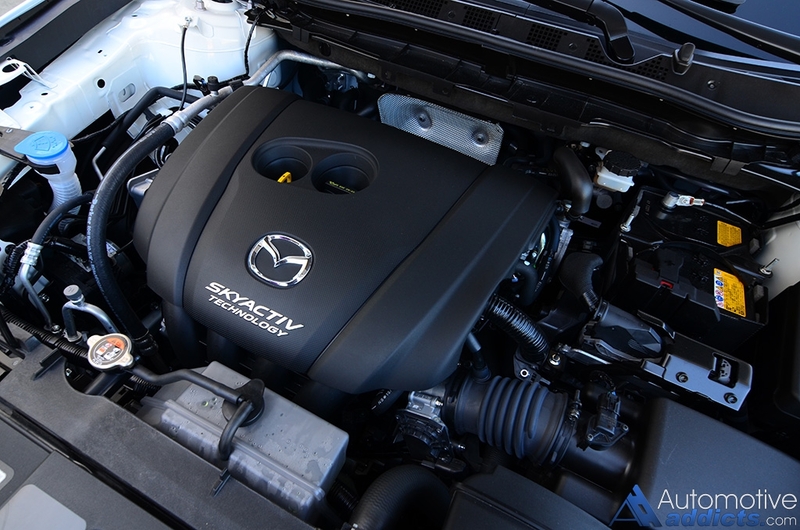 The Skyactiv tech is alive and well in the 2.5-liter engine, which is also shared among many other offerings throughout the brand. 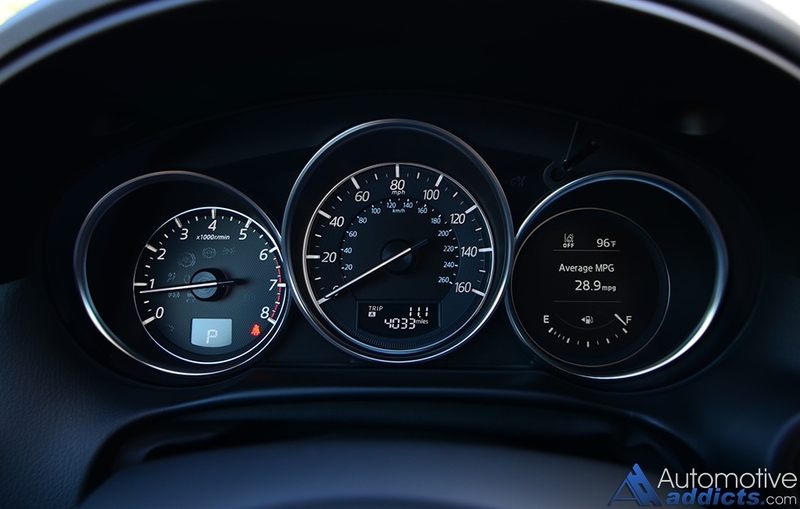 The CX-5, thanks to its Skyactiv technology, lightweight construction, and sleek air-cutting body lines, the EPA fuel estimate comes in at 26 mpg city, 33 mpg highway, and 29 mpg combined. The takeaway here is the combined mpg being 29 mpg, which identical to the smaller and less powerful 2.0-liter engine’s consumption figure. In my test, I was able to match the combined figure and occasionally returned 34 mpg on the highway when matching the posted 65 mph speed limit. 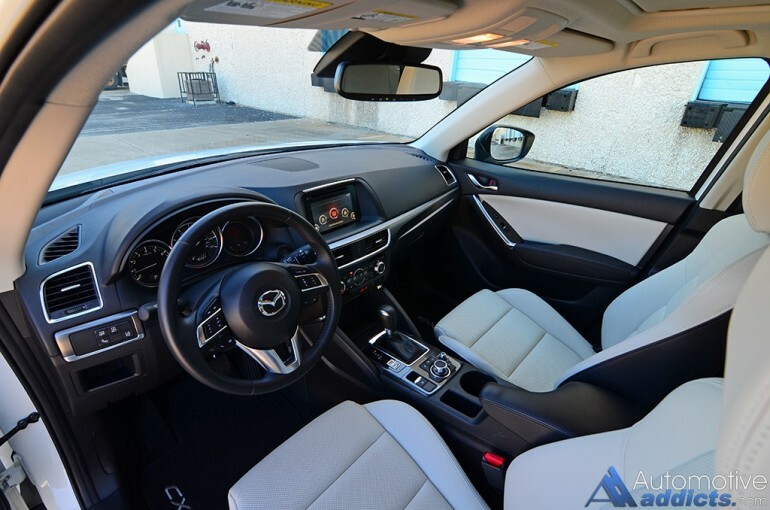 The versatility of the 2016 Mazda CX-5 shines brightly throughout its compact-classified cabin. 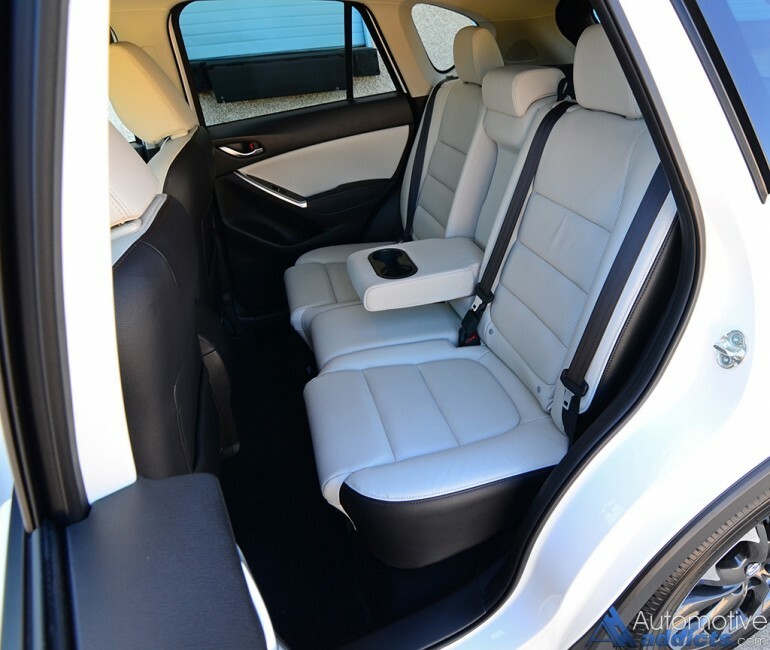 The front heated perforated leather seats are somewhat supportive and match its sporty handling characteristic with just enough bolstering and comfort for long trips. The driving position is also agreeable with enough adjustability to comfortably fit my 6-foot-3-inch frame. The rear 40/20/40-split folding seats surprisingly have plentiful leg room (39.3-inches) and headroom (39-inches). The cargo space, accessed by a manual lift gate is at a respectable 34 cubic feet with the rear seats in place and opens up to 65.4 cubic feet by folding down the 3-way-split rear seat backs. 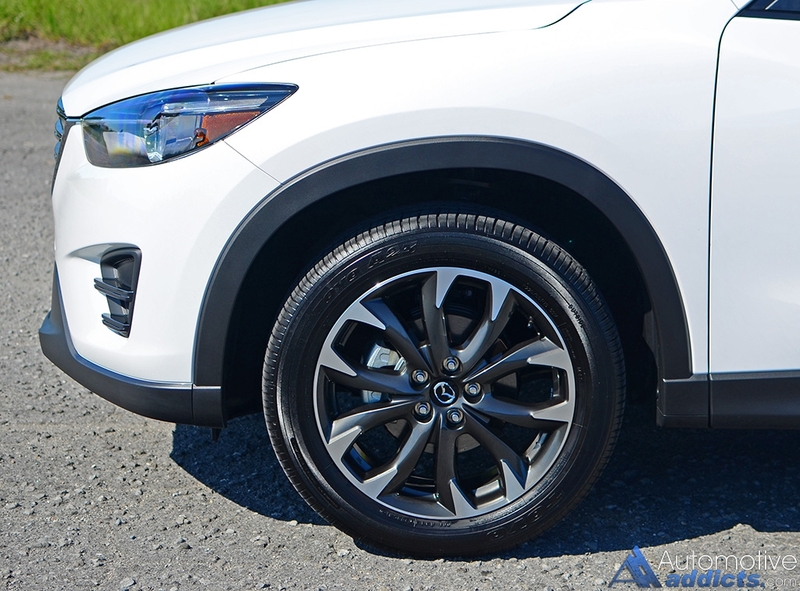 Mazda went the extra mile in more ways than one when it comes to equipping the new CX-5 after its mid-year mild refresh. My top-trimmed CX-5 Grand Touring FWD test vehicle featured several active safety features, including a Smart City Brake Support system to detect stationary objects at speeds up to 19 mph where it will automatically apply the brake if you fail to respond to a forward collision warning. Additionally, the i-ActiveSense package adds a Smart Brake System, which enacts automatic braking at higher speeds after the system’s warning is ignored. Also part of the package the CX-5 gets adaptive cruise control, lane departure warning, and automatic high beam control of its new LED headlights. Other equipment highlights of the CX-5 Grand Touring includes an updated and larger 7-inch infotainment system with navigation controlled through a central multifunction control knob or touch screen access when the vehicle is stationary, 19-inch wheels, automatic rain-sensing wipers, automatic adaptive LED headlights, LED taillights, heated mirrors, heated front seats with leather upholstery, satellite radio, and a dual-zone climate control. 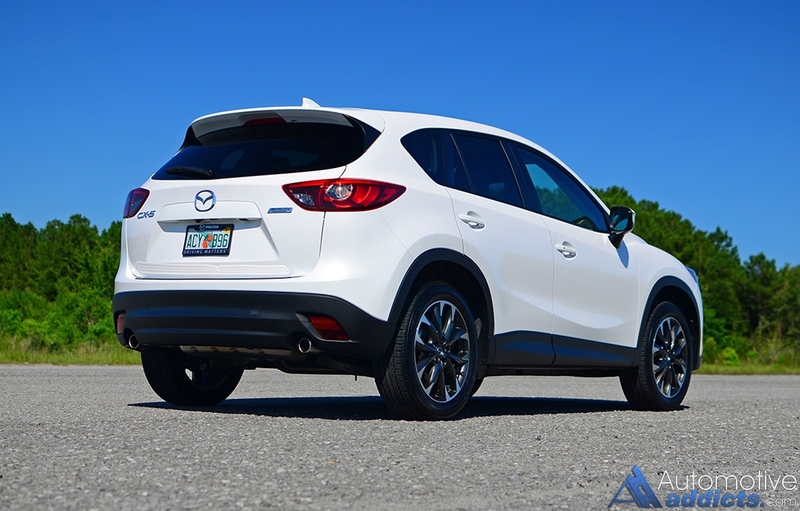 The 2016 Mazda CX-5 retains a respectable price point even with the substantial equipment list as part of the top Grand Touring trim. 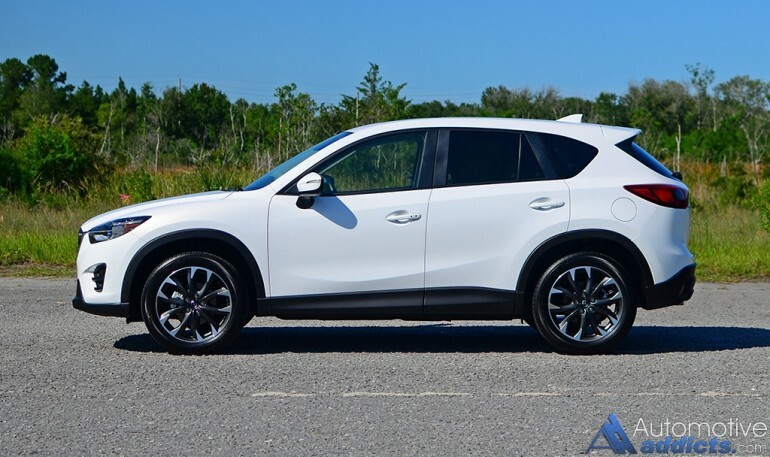 The 2016 Mazda CX-5 in its base Sport trim and manual transmission starts at $23,595 before any fees. 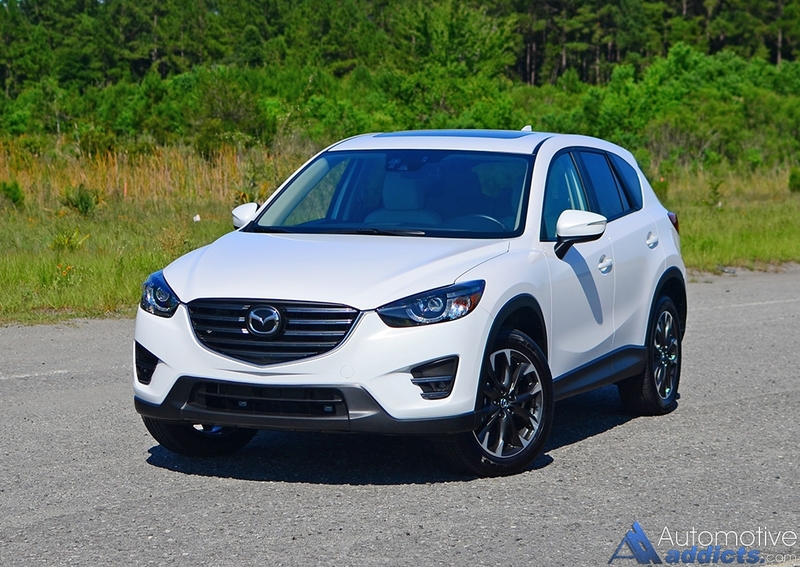 My loaded-up 2016 CX-5 Grand Touring FWD test vehicle has a price of $32,610 (including a $900 delivery, processing and handling fee), which falls in line with much of the compact crossover competition. EPA passenger volume: 103 cu.ft.